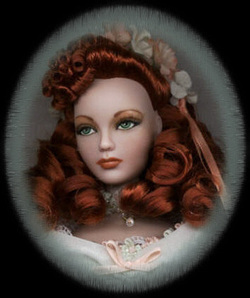 "Southern Comfort" was inspired by one of my repainted costumed dolls. As is the case with most of my stories, an abbreviated version of Southern Comfort was featured in the original description for the auction of the doll. The doll and that version of the story now reside in the home of a private collector. to find that guests had already arrived, butmost definitely not the ones she had been expecting. Union soldiers guarded every entrance and exit of the house, their eyes searching the property anxiously. Neely drew near the verandah. “Yankees at Cypress Point! I won’t have it!” she stated emphatically, staring pointedly at the boy who had spoken. belonged to all too well, even before he appeared around the corner of the house. Since the last time she had seen him, nearly six months ago, he had haunted her dreams, conjuring up images that were better forgotten. After all, he was now the enemy—a Union officer, and a traitor to even his own family. "Are you frightened, my love?” he whispered gruffly, a familiar mocking glint in his eyes. found his very nearness frightening, but not for the reasons he imagined. copper skin and raven hair, evidenced his Seminole heritage. “Captain Castiglio, I’d wager that the only comfort you’ll be getting in this house will be from what's left of Pa’s best brandy,” she replied through tightly clenched teeth. Despite her anger, her heart beat a rapid tattoo as he smiled again, his teeth gleaming white against his skin. Oh, how she had missed that smile! “We will see, my love. More pressing matters have kept me from fulfilling my duties at home. But like it or not, my sweet little Rebel, you are still my wife,” he replied, his eyes heavy with warning. could muster, uncertain whom she hated most at this moment—Rafe, for his treachery and conceit; or herself, for being just frightened enough of what the Union army might do to both her and Cypress Point if she didn't go along with his charade. His wife, indeed! In a pig's eye! Neely thought furiously. Apparently accepting Rafe’s bold lie, the majority of the assembled Union troops bade Neely a polite farewell and departed swiftly, leaving behind only a few enlisted men to ensure his safety during his visit. They stood some distance away. While they remained close enough to observe Neely and Rafe, they were still far enough away that any conversation between the two would be unlikely to be overheard. It was of no matter, though, since Neely was completely bereft of words. She knew of nothing she could say to Rafe at this moment that would express both her gratitude for saving Cypress Point from torching and her utter contempt for the way in which he had done so. expect me to receive a proper welcome, or they may become suspicious,” he added as he came to her side and slipped his arm around her slender waist. sense, but her heart was beating so fast at his very nearness that she feared it might burst if she allowed him to kiss her in the manner he surely intended. While she pondered these thoughts, Rafe suddenly pulled her body against his and his lips met hers in a hungry, crushing kiss. the stubborn barrier of her lips. He slipped his hands up her back and moved her arms upward so they encircled his neck loosely. Patient but persistent, his tongue finally parted her lips. Without realizing it, Neely tightened her arms around his neck and molded her body more firmly to his. Now hopeless to resist, she was caughtup in the swirling emotions the familiar taste and feel of him evoked. She closed her eyes and a whimper of desire escaped her throat as his lips moved down to her neck, trailing a burning path to the barely concealed fullness of one breast. His lips paused only long enough to tease that tender flesh, then traced a path back up to her ear, where his warm breath caressed her as he spoke. Neely’s eyes flew open in shock. She felt a blush rising through her body from the very tips of her toes as she looked down and saw the soldiers who had been watching nudging each another and smiling. Aflame with humiliation, and God help her—desire, she pushed Rafe away and ran inside. Tears of anger and frustration burned her already flaming cheeks as she flew past the two servants in the foyer. room for him and dem boys?” Carolina dared ask. “Take a rest, boys,” Rafe instructed his men. “I might be a while,” he added with a conspiratorial wink as he stepped inside. felt toward him, and that she might reconsider the proposal he’d made on his last visit. But despite the fact that she was obviously still physically attracted to him, he could tell that she would remain firm in her conviction not to marry a Yankee soldier. chest and felt for the key he knew would be there. He smiled as his fingers closed around it. Upon opening the door, he was somewhat disappointed to discover than the contents had been rifled, with less than two fingers of cloudy whiskey left in any of the bottles inside. He carefully pushed them aside, inserted the key, and tapped lightly on the false panel at the back. It opened slowly, revealing two slightly dusty, but clearly full, bottles of fine, dark whiskey. Point were rampant with growth. In the numerous streams, fish were abundant, and evidence of deer and other game had been plentiful along their path. In his youth, he had explored every inch of the vast wilderness surrounding his home with his Seminole cousins. He had gone swimming with the manatees and even wrestled an alligator or two. He loved this land like no other part of the country, for it was home. He was a part of it, and it was a part of him. There was only one thing to mar his great pleasure of returning to everything he loved… and that was Neely’s cold reception. It was clear she still hadn’t forgiven him for joining the Union effort, even though that might have been the only reason that Cypress Point was spared the total destruction that so many of the other homes on the river had met recently. He had tried to explain his position, but Neely couldn’t possibly accept the fact that his decision had not been one of betrayal to the South or his people. with him, she would be proud of him for following his heart. She had done the same in defiance of everyone she knew by marrying not only outside her tribe, but outside her race as well. almost had. Though Rafe would mourn the loss of his parents’ hard work and the happy memories that dwelled within those solid walls, he was more fearful of what might happen to his brother. defend their home than Neely had been to defend hers. At least he prayed that was so. How would he be able to live with himself knowing that he might have saved Neely’s life by sacrificing his brother’s? refusing to surrender, even though they had long been defeated. He only hoped that for some of them, surrender would not come too late. A harbinger of another of Florida’s violent and unexpected summer storms, a sudden gust of rain-laden wind swept through the French doors of Neely’s room, setting them banging sharply against the wall. wonderfully right to be in his arms again! his home as it was Ramon’s. diligent care and hard work, and now that he had passed away, it belonged to her, and no one else! A hash rap on her door drew her from her thoughts. “Who’s there?” she asked. “Go away, Rafe!” she replied in annoyance. “We have nothing to talk about. Rafe’s eyes suddenly turned dark and stormy, a sure sign that she had overstepped the boundary of his tolerance. He lunged forward and grabbed her roughly, pulling her close. “W-what are you doing?” Neely stammered, still trying to put on a brave face in spite of the fact that she had begun to tremble. She twisted in his grasp, but he held her tightly, giving her no quarter. her warned that it was only a trick and whatever transpired this night would be quickly forgotten in the first blush of morning light. died at the fleeting expression of hurt that passed over his proud features. For an instant, she wished she had never uttered them, could take them back, or do anything at all to erase the complete look of inconsolable loss etched upon his face---but that was only for an instant. With that, he turned on his heel and stalked out the door, slamming it so hard the windows rattled. screamed around the eaves like the cry of a banshee and thunder rolled across the sky chasing brilliant streaks of blinding lightning. she only picked at the sumptuous feast. her bed. As the storm began to dissipate, the rain assumed a pleasantly lulling rhythm, finally calming Neely into a deep and exhausted sleep. The night was dark and moonless, the star light dimmed by the cover of clouds. deliberately strong grip. Instantly alert, a scream rose to her lips, but was muffled by the hand that covered them. Her eyes widened in panic as she looked up into the face of her attacker. a woman, and since you don’t seem to care much for the Captain’s brand of lovin’, maybe you’ll like mine. I’m sure he won’t mind if I give ya’ a go. He’s a dead man, anyway,” he said. Still holding her fast, he bent his head to her breast, which had been almost fully exposed by efforts to free herself. Her action had exactly the response that Neely was praying for. Not only did he remove his hand and release her, but let go a streak of swear words loud enough to wake the dead. If nothing else, Aaron and Carolina had heard and would surely come to her aid. That is, if they are still alive, she thought dismally. Neely wasted no time in slipping from the bed and fleeing toward the door. Clinging to the hope that her faithful servants were somewhere nearby and safe, she prayed that her attacker had not already harmed Rafe. She was more concerned for the safety of those she loved than for her own. After all, this had not been the first time during this war she had been forced to fend off unwanted attention. Living in such a secluded location, she had been extremely fortunate that it had happened no more often than it had, but her few experiences had at least taught her how to defend herself. If she had only thought to keep the gun under her pillow as she usually did! But with Rafe in the house, she had somehow felt safe. He reached out for her with both hands, but Neely sidestepped. He caught only the sleeve of her nightgown, shredding the thin, worn fabric and nearly rendering her naked. Neely clutched what was left of it to her body and continued on her path to the door. Using her knowledge of the layout of the room to her advantage, she stopped to kick the vanity stool in the path of her pursuer. She heard him stumble and fall, but could tell by the sound of his quick recovery it would only be a minor delay. She gripped the doorknob and felt it slip through her sweaty hands, her panic rising to a crescendo that burst from her lips in a strangled sob of fear and frustration. She was still grappling with the knob when the door was suddenly pulled from her grasp and flung open wide. She tumbled through the opening, straight into arms of the looming figure that filled its frame. continued to strike at his chest until his voice and words finally registered. “Neely! It’s Rafe!” he had been saying repeatedly as he tried to thrust her aside. managed to get to him before he had the chance to leap from the balcony, which had clearly been his intention. “What the Hell were you thinking, Garrett?” Rafe roared as he pulled the man back into the room. Neely lit the candle by her bedside and the room was flooded with light and shadow. Garrett wore a slightly sheepish, but defiant, expression as he tried to shrug out of Rafe’s grasp. She was able to surmise, with great relief, that Garrett had no weapon. short prayer of thanks when she saw none. “Where did you get that idea?” Rafe demanded. chuckling a little. “Cain’t say as I blame you, though. I’d a lied to save her, too, but she shore is a mean little minx. Put a good size hole in my hand with them purty teeth.” As though Rafe wouldn’t be inclined to believe it, Garret raised his hand to show him the wound Neely’s teeth had left on his hand. "Oh, Rafe, I lo--” she began. “Put a wrapper on, for God’s sake!” Rafe shouted in annoyance, cutting off the rest of her words. He couldn’t prevent his eyes from devouring her exposed flesh, and what irritated him even more was that Garrett was enjoying the same feast. Neely had been so wrapped up in the revelation of her feelings for Rafe that she had barely been aware that she was nearly naked. “Oh God,” she muttered. Blushing profusely, she snatched up her wrapper from the end of the bed and modestly turned her back on the men while she slipped it on. Rafe made a supreme effort to ignore her as he ushered the reluctant Corporal Garrett out the door. Neely naturally assumed that was where she would find Rafe. She peeked in the door and saw him sitting in her father’s favorite chair, his features set in firm resignation. “I’m so sorry, Rafe…” she began, but he silenced her with a stony glare. immediately after--or maybe even during--the time they’re burning Cypress Point to the ground. There’s a way to save Cypress Point and even ourselves, if you’ll put aside your stubborn pride and honor and listen to me,” she insisted. “Never mind. I don’t have time to explain it now,” Neely replied distractedly, quickly calculating the time it would take them to get to the Graham’s house and back. Fortunately, it was still fairly early and the Graham’s surely wouldn’t object to her visiting with her uncle. The morning dawned clear and bright. A mockingbird perched in the ancient oak outside Neely’s bedroom, serenading the house with its cheerful, repetitive song. placed her hand on the broad expanse of his bronze chest, tracing the well-defined muscles with her finger.“No regrets at all,” she admitted with a contented sigh and snuggled closer. “But not to the rescue this time,” Neely quipped, struggling to free herself from the tangled bedclothes. “Well, we’d best go face the music, in any case,” Rafe replied. the other as they did so. When they finally considered themselves presentable, they shared a long embrace and a tender kiss and went downstairs to greet their impatient guests. the bottom of the stairway. As soon as Rafe stepped within reach, one of them reached out and clapped heavy manacles on his wrist, while the other performed the same service for Neely. corner. Apparently, Rafe’s threat to have him court-martialed for misconduct had been enough to keep him silent, for though he glared at her and gingerly rubbed his wounded hand, he didn’t utter a single sound. “May I inquire as to the meaning of this intrusion, Major Blakemoor?” Rafe asked politely. “Captain Castiglio, I have it on good authority that you obstructed orders to burn this premises by intentionally deceiving the Union Army. This was reported to me last evening by two privates under you command. Soames and Haynes. Are you familiar with them?" he was about to prove Neely’s right to that title and send Blakemoor packing, he wisely held his temper in check. In his experience, Malcom Blakemoor had always known Rafe to be an honest man. pushing Rafe ahead of him. “May my wife be allowed to join us?” Rafe ventured. Neely to follow Rafe. Once inside the study, he gave his men orders to remove the manacles but to stand at ready with their weapons. “Can’t afford to take any chances,” he told Rafe almost apologetically. inspect it thoroughly enough to ascertain that the ink was barely dry. therefore have been easily coerced into forging a marriage license if it meant saving the life of his niece? “Before you go, Mrs. Castiglio, I have some news that may interest you concerning your brother-in-law.” Blakemoor said. Neely’s breath caught in her throat and she could see the clear anxiety in Rafe’s eyes. “What news, Major?” she asked nervously. gliding gracefully out the door. “Your wife is a remarkably lovely woman. You are very fortunate, Captain,” Blakemoor commented. “Indeed I am,” Rafe agreed.